On similar lines as the Harley-Davidson e-bike that was unveiled at CES 2019, KTM Is also actively testing an e-Scooter. 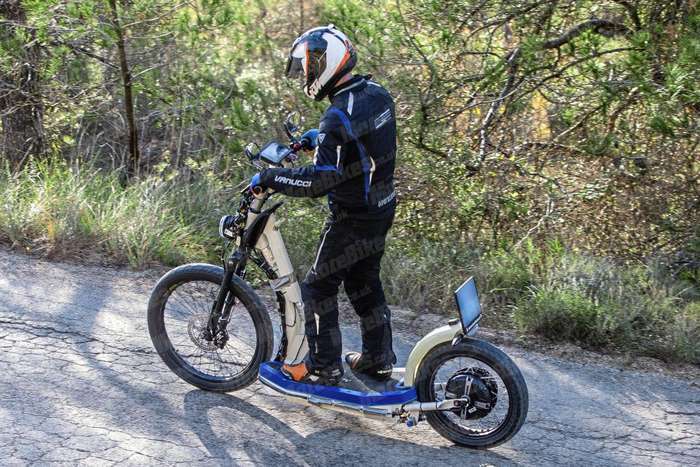 Though the company has its range of electric bicycles focused essentially for trails and off-road, this time round the eScooter targets millennials. The rider was seen on what looked like an electrified kick/razor scooter. 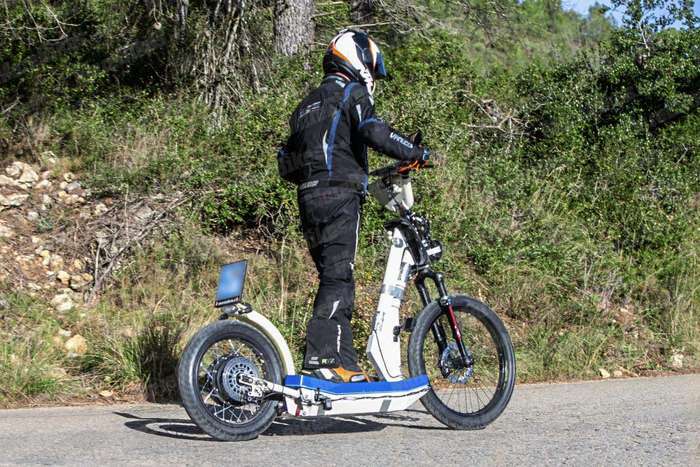 Sporting a blue and white color scheme, the eScooter was noted with a larger wheel in the front and a smaller wheel at the rear. There was also a belt on the right side probably connected to an energy recovery system while a fully digital TFT instrument cluster was noted bolted on the handlebars. This could be the full color TFT display that is also seen on the KTM 390 Duke. Batteries of the KTM electric scooter could be positioned under the floor board, as is also seen on the Harley-Davidson electric scooter. The electric motor was positioned on the left side of the rear wheel. The KTM eScooter, though being tested is not expected to be launched in India anytime soon. KTM is not new to the world of electric vehicles. The E-Speed was showcased at the 2013 Tokyo Motor Show where it gained much attention from viewers. KTM E-Speed is positioned as an electric scooter for urban commuters. It is a zero emission scooter powered by an electric motor offering 15 PS power and 36 Nm torque sent to the rear wheel via a belt drive. This E-Speed scooter can reach a top speed of 80 kmph. KTM claims that the E-Speed scooter has a range of 64 km on full charge and its 4.36 kWh battery pack can get a full recharge in a matter of 2 hours via a regular power socket. Suspension is via WP while braking is via 220mm disc brakes at the front and rear.